About 300 individuals and 56 wagons were in the company when it began its journey from the outfitting post at Iowa City, Iowa. 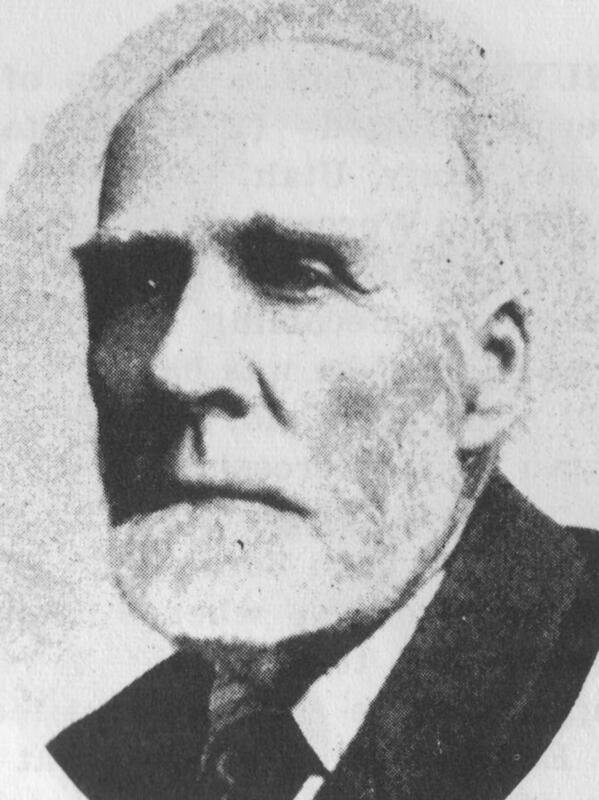 Dan Jones, who was returning from a mission to Wales, was initially the captain but only for about two weeks. He then left the company and moved on ahead at the request of Brigham Young who wanted him to help translating the Book of Mormon into Welsh. John Hunt led the company the rest of the way to Utah. Anderson, Rosella B. and Lilly B. Frandson, "A History of Hans Ulrich Bryner, Sr. and Hans Ulrich Bryner, Jr., 1-4. Dan Jones Emigrating Company, Journal 1856 May-December. Driggs, Ben W., [Letter], in "Pioneer Trail Experiences," Deseret Evening News, 26 April 1913, sec. 3, X.
Linforth, J., [Letter], Latter-day Saints' Millennial Star, 10 January 1857, 27-28. "Notice," Deseret News [Weekly], 26 November 1856, 301. "Our Pioneers," Spanish Fork Press, 14 February 1924, 4. Parsons, Mary C[hristine] Johnson, "A Handcart Survivor," Deseret Evening News, 29 June 1897, 8. Pay, Mary G. to S. S. Jones,Handcart Veterans Association, 18 Oct. 1908. Handcart Veterans Association, Scrapbook, 1906-1914, fd. 5. Pay, Mary Goble, Autobiographical sketch 1896-1909, 2-5. Snow, Erastus, "Correspondence of President Erastus Snow," The Mormon, 27 Sep. 1856, 2-3. Spicer, William, [Reminiscences], in Orson F. Whitney, History of Utah, 4 vols. , 4:431. Spicer, William to S. S. Jones, Handcart Veterans Association, ca. 1906. Handcart Veterans Association, Scrapbook, 1906-1914, fd. 2. Stewart, Elizabeth White, [Autobiography], in Workman, Mary Ellen B., comp., "Ancestors of Isaac Mitton Stewart and Elizabeth White" . "The Plains," The Mormon, 31 January 1857, 2. The John A. Hunt wagon company left Iowa City in the latter part of August and set out on their final, long journey from Florence, Nebraska on September 2, 1856. Most of the emigrants who crossed the plains in the Hunt company had crossed the Atlantic Ocean via the ship Thornton, which sailed from Liverpool, England on 4 May 1856. Others traveled by way of the ship Horizon, which sailed from Liverpool on 25 May 1856. According to Captain Hunt's journal, when the company left the camping ground near Iowa City, it consisted of 56 wagons, but when fairly out on the plains it numbered 240 persons, with 50 wagons, 297 oxen and cows, and 7 horses and mules. While journeying through Iowa, Thomas Parry, a teamster, aged 21 years, died on August 13th. On the 14th, Elders Ferguson, Webb, McAllister and Dan Jones started ahead with the mule teams, leaving John A. Hunt in charge of the company. On the 15th the train crossed the Des Moines River at Fort Des Moines, and on the 27th arrived at the Missouri River and camped near the town of Florence. On Sunday the 31st the company moved out of Florence about 3 miles, to a place where the feed was good, and in a meeting held in the evening Apostles Erastus Snow and Franklin D. Richards addressed the emigrating Saints. On the 8th and 9th the company was ferried across the Loup Fork. Wood River was crossed on the 15th. On the 2nd of October the company crossed the Platte from the north to the south side, at a point about 30 miles east of Chimney Rock. While traveling on the 7th some of the oxen took fright and stampeded. About 12 wagons left the road, carried off by the frightened cattle at a break-neck speed in all directions. Sister Esther Walters from Wales was knocked down and so injured that she died a few minutes later, leaving behind an infant that was only four weeks old. On the 9th of October the company arrived near Fort Laramie. On the 12th Brother [William] Beesley and [William] Bell with their respective families and wagons left the company and returned to Fort Laramie, in order to escape the severity of the weather. On the 19th the company passed Captain Martin’s hand-cart company just as the people were pulling out after dinner. That same evening the company arrived at the upper crossing of the Platte, followed closely by the hand-cart company. Captain Hodgett’s company had just forded the stream. When the emigrants in these three respective companies arose on the morning of Monday, October 20th, they found the ground covered with snow. The camp was detained because of the snow. On Tuesday, October 28th, Joseph Young and other volunteers from Salt Lake City arrived at the emigrant camp. They quickly left the next day to return for more supplies and told the emigrants that they would be back in ten days. The Hunt company continued the journey to Salt Lake on October 29th. They arrived to Devils Gate on Wednesday, November 5th. Daniel W. Jones and a few other men stayed behind with several of the wagons, oxen, and worldly possessions of the emigrants. The company reached the South Pass on Wednesday, November 19th and arrived at the Green River on the 26th. By December 4th, the last of the remaining wagons had arrived at Fort Bridger. On December 6th, a messenger from the Valley brought news that several teams were coming to bring in the remainder of the emigrants. By December 15th, the emigration was completed and the companies reached Salt Lake City.